4.5” wide Reflective Sensor Label Dispenser. Peel and Present operation allows for easy manual removal of label. 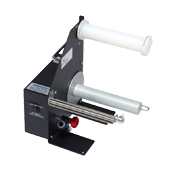 You can adjust the length of label that is dispensed as well as the speed it is dispensed. 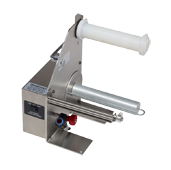 4.5” wide Reflective Sensor Label Dispenser with Stainless Steel chassis. Peel and Present operation allows for easy removal of label. With a completely sealed chassis this unit can be easily wiped clean. Great for food packaging, pharmaceuticals, or cosmetics applications. 6.5” wide Reflective Sensor Label Dispenser. Peel and Present operation allows for easy manual removal of label. 6.5” wide Reflective Sensor Label Dispenser with Stainless Steel chassis. Peel and Present operation allows for easy manual removal of label. With a completely sealed chassis this unit can be easily wiped clean. Great for food packaging, pharmaceuticals, or cosmetics applications.